Mary Bobo was born on 3 February 1842 at Meigs, Ohio, USA. She married Isaac C. Sweet on 14 September 1861 at Meigs, Ohio, USA. Her married name was Sweet. Mary Bobo died on 31 May 1895 at Albany, New York, USA, at age 53. Mary Bobo was born in 1844. Mary Annace Bobo married Andrew Cagg on 12 April 1849. Her married name was Cagg. Mary Lucretia Bobo was born on 3 October 1798 at Maryland, USA. She married Jacob Dunbaugh on 5 March 1818 at Athens, Athens, Ohio, USA; Named after Athens, Greece; home of Ohio University. Mary Lucretia Bobo married James Hudson on 11 October 1821 at Athens, Athens, Ohio, USA; Named after Athens, Greece; home of Ohio University. Mary Lucretia Bobo Notes of Roberta McKenzie: 1830 Athens County, Ohio Census; 1843-1846Miami County, Ohio; 1846-1849 Marshall County, Illinois; 1849 to GreenCounty, Wisconsin; 1850 Green County Wisconsin Census. Her married name was Dunbaugh. Her married name was Hudson. She died on 17 October 1883 at Wisconsin, USA, at age 85. She was buried; Albany Gap,Greene,Wisconsin,USA. Mary Northa Bobo was born on 23 August 1845 at Hebbardsville, Athens, Ohio, USA.1 She married Elias Wayne Sharp, son of Thomas Sharp and Margaret Stine, on 4 April 1867. 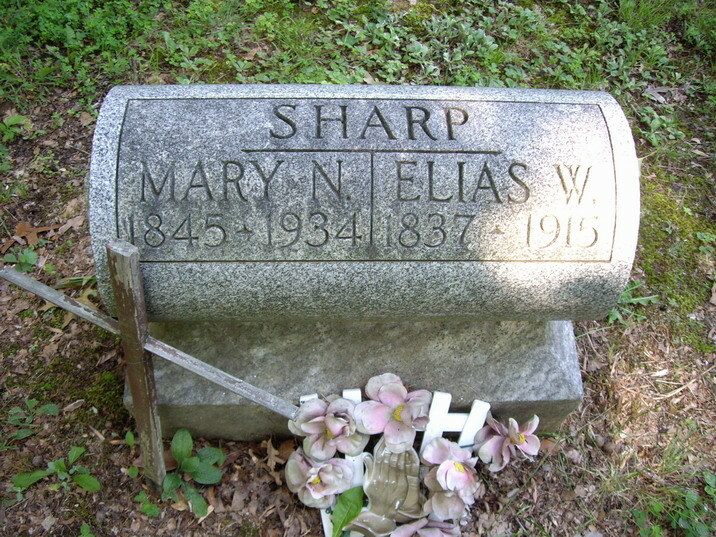 Her married name was Sharp. Mary Northa Bobo died on 3 February 1934 at Hamden, Vinton, Ohio, USA, at age 88. She was buried on 6 February 1934 at Keeton Cemetery, Vinton, Ohio, USA. Mary Bobo was born on 28 February 1803 at Ohio, USA. As of 1813, Mary Bobo also went by the name of Polly.1 She married Amos Shry on 22 June 1826 at Athens, Athens, Ohio, USA.1 Her married name was Shry. Mary Bobo died on 7 August 1888 at Vinton, Ohio, USA, at age 85. Mazey Bobo was born in 1850. Mellissa Bobo was born in 1849. Michael Bobo was born in 1847. Michael Jasper Bobo was born on 27 July 1838 at Ohio, USA. He married Eliza A. Scott on 14 September 1859 at Vinton, Ohio, USA. Michael Jasper Bobo Michael died 7 May 1919 aged 80 years, 9 months, and 10 days. He died on 7 May 1919 at age 80. He was buried at Zaleski, Vinton, Ohio, USA. Nancy Bobo was born on 2 March 1861 at Meigs, Ohio, USA. She married David Caster on 24 September 1882. Her married name was Caster. Nancy M. Bobo was born on 29 March 1873. Nehemiah Bobo was born on 12 November 1858. He died in 1918. Nehemiah G. Bobo was born on 17 June 1815 at Hebbardsville, Athens, Ohio, USA. He married Nancy Wood on 25 October 1838 at Meigs, Ohio, USA. Nehemiah G. Bobo Notes Helen Sharp Morris: Nehemiah is buried in the School LotCemetery. Notes of Roberta McKenzie: Census: 1850 Athens Twp., AthensCounty, Ohio. He died on 15 April 1896 at Meigs, Ohio, USA, at age 80. He was buried at Meigs, Ohio, USA. Norman Theodore Bobo was born on 2 October 1901. He married Beulah Anita Troxler after 1918; Divorced. Norman Theodore Bobo died on 17 May 1968 at age 66. He was buried after 17 May 1968 at Golightly Cemetery, Madison, Alabama, USA. Oliva Bobo was born in 1840. She married Peter H. Roach on 10 January 1861 at Vinton, Ohio, USA. Her married name was Roach. Phares Bobo was born in 1832. Philena Bobo was born in 1840. Rachel Bobo was born in 1832. She married Robert Dickson on 25 January 1849. Her married name was Dickson. Ruth Bobo was born on 5 March 1801. She married Bazzel Gabriel between 16 January 1821 and 1822 at Athens, Athens, Ohio, USA; Named after Athens, Greece; home of Ohio University. Her married name was Gabriel. Ruth Bobo died on 23 December 1823 at age 22. Ruth Bobo was born on 14 May 1823. Sara Bobo was born in 1839. Sarah Bobo was born on 10 September 1808. She married Isaac Shry on 28 February 1828. Her married name was Shry. Sarah Bobo died on 4 December 1885 at age 77. She was buried at Zaleski, Vinton, Ohio, USA. Sarah A. Bobo was born in 1854 at Ohio, USA. Sarah Jane Bobo was born in 1846 at Delaware, Indiana, USA. She married Absolum Wheeler in 1866 at Missouri, USA. Her married name was Wheeler. Sarah Jane Bobo died in January 1929 at Carroll, Arkansas, USA. She was buried at Carroll, Arkansas, USA.